This entry was posted in Comments about Cycling on December 18, 2016 by Steve Tilford. I don’t eat much red meat. It isn’t that I’m all that against it, it is just that I’m not that into it usually. I was a vegetarian when I first started racing. There was a guy in Kansas City that was really good, Bill Nickelson. He pretty much beat up on all the guys when I was 14. He was a vegetarian, so my brother Kris and I decided to emulate him. We asked him exactly how he ate and he told us. He also suggested a ton of vitamins to take. Calcium, Magnesium Zinc, Vitamin E, Pantothenic Acid, Niacin etc. I can’t even remember them all. I did this for a long time, pretty much until the first time I got to go to Europe to race. Salad bars and options were always available here in the states, so I didn’t really think much about eating before I fly to Europe. The first race we did was the Tour of Vaucluse in Southern France. I wrote a post sort of about it. It was a Pro-AM race with lot of great professionals, plus the Russian and Eastern European amatuer teams. The race fed us and I realized pretty much the first day that it was going to be nearly impossible to not eat meat. That was nearly all they served for meals after breakfast. So maybe the 2nd day, I decided to quit being a vegetarian and eat a steak. I figured it was the only way to survive the trip. So I walked over the food line and got a steak. I really had no desire to switch up my diet, but there was no other way. I was sitting there and started eating and it wasn’t good. It was super chewy and hard to swallow. I was thinking that I really hadn’t been missing out on anything all those years, but knew I needed to finish the meat to get through the stage that day. While this was all going on, a French rider, maybe even Laurent Fignon, I’m not sure who it exactly was, came over, kind of started laughing and pointed at the steak. He then did a couple neighs. I didn’t know what he was doing, then thought a second and realized that he was mimicking a horse and implying that it was horse meat. I pretty much dropped my fork and stopped chewing. I was nearly sick. I couldn’t believe I was eating horse. That was it for the meat that race. I wasn’t going to “risk” consuming horse again. When that stage race finished, we raced the next few weeks in Italy and didn’t have that problem. Anyway, I’m not proud of consuming horse meat. I never it attend to do it consciously again. They still eat it over in France. I’m not sure what that is all about. Maybe it is one of the reasons I’m not that into red meat in general, I don’t really know. I have no idea how people eat these guys. It doesn’t sit well with me. Why is horse not okay but factory hogs, of which ~97% never see sunlight, or turkeys, chickens, feed-lot fattened cattle are? Not trying to be provocative, but I don’t understand horse logic. Come have a look at the kill pens here in Texas. Every horse is headed to Mexico unless they can coerce your heart strings to pay their ransom. But why not hogs or feedlot cattle? I’ve eaten horse… didn’t know it until after reading the label. It was ok.
Whale, on the other hand, yuck… tastes like fishy beef. Truly nasty flavor. I went to High School in Hawaii in the late 70’s. Some of my teachers were of Hawiian and Filipino heritage. One of my teachers was cooking some meat on a small hibachi outside of the classroom. When the meat was cooked I tried a few bites of it. It was only after I ate it did I find out that it was dog. God told Pope Gregory III to ban horse meat consumption in the 8th century. Way before that God told Jews and Muslims to cut out out pork. When I was growing up God changed his mind about only fish on fridays. I don’t understand the bias against horse. I’m not advocating eating horse, or any other meat for that matter, but don’t understand the logic. 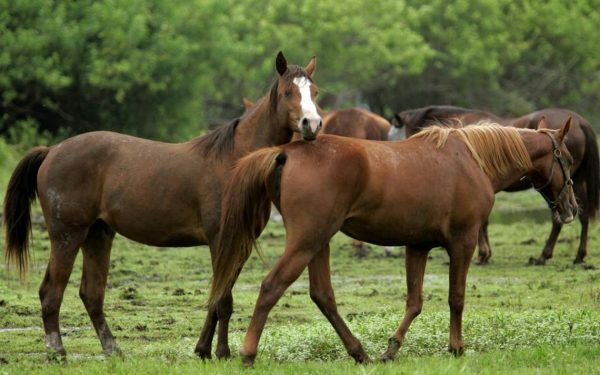 How is a horse any different than a cow…or pig…or chicken…or farm raised fish, or herd managed white tail (or any other so-called “wild” animal)? Didnt Eddie B promote eating horse his theory was you are what you eat so eat fast meat. Gossip I heard was Davis said “then we should eat Chetah! !” Maybe thats why Davis was so fast in a sprint hahaha?! Three quarters of the world is vegetarian…….eat mo veggies!!! People would change what they eat if They had to slaughter and butcher theyre meat! So what was the French rider eating? Hill’s in Topeka was the first FDA facility approved to process horse meat for human consumption. They did it before the FDA existed also maybe starting around 1907. Then god created the Filet of Fish sandwich for McDonalds since burger sales were down on Fridays during Lent. Horses here in the US are not raised as food animals therefore are given drugs throughout their lives that are banned in food animals. Kill buyers ship our horses to Canada and Mexico where they are slaughtered and the meat is shipped globally to places that eat horse. With this in mind, remember our horses are not raised as food and have toxic meds in their systems so we are poisoning the globe with our horses. In the 60’s the Pike Street Market in Seattle had a butcher shop that sold horse meat exclusively. During WWII, when beef was rationed in the US, the Harvard faculty club regularly served horse steaks for lunch. The practice continued for many years and might be the case even now. I lived in Belgium for three years, and am here now for the holidays to see friends and family. I plan to move back permanently in the next year or so…I say this all because horse is a perfectly normal thing to eat in Belgium(OK, maybe normal isn’t correct, but plenty of meat places serve it). I’ve had it one or twice, but to be honest I obstain. But not for any “moral” reason, but because in my 20s I lived on a horse farm. To me, they are pets… Which just puts a kybosh on it for me…plus I’m just sorta a wuss about gamey meat. That said, as an American I can grasp your dislike. Isn’t the Bicky burger in Belgium at least part house meat? Every frituur has one on the menu. Horse meat is consumed here in the Netherlands, which I find surprising because horses are doted upon as are dogs, human’s best friends. A horse got personality. Personality goes a long way. Meat is meat, who cares what it is. I love beef, pork, whatever. Horse or dog makes no difference. As long as it tastes good. I have no idea why anyone eats animals period. Anyone who has seen what goes on in a factory farm, dairy farm or slaughter house would be HORRIFIED. Eat vegetarian!